On October 8th, Gallup issued three polls that present next month’s elections as a likely bloodbath for congressional Democrats. One bannered “Voter Engagement Lower Than in 2010 and 2006 Midterms,” and reported that by a whopping 19%, Republicans felt more motivated to vote than did Democrats, and were 18% more “Enthusiastic” about voting than were Democrats. 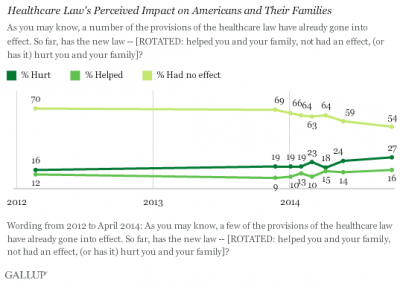 Another headlined “More Still Say Health Law Has Hurt Instead of Helped Them,” and reported that 27% say they’ve been hurt by Obamacare, the Affordable Care Act, 16% say they were helped by it, and 54% say that it “had no effect” on them. A third poll was titled, “In U.S., Uninsured Rate Holds at 13.4%,” and reported that, whereas in 2008 there were 14.6% of respondents who said that they had no health insurance, that figure is now 13.4%. Once he won the White House and was starting his Presidency, he was promising to cut 31 million off that number, which still would bring it down 67%. But instead, the health insurance plan that he initiated and signed into law has brought this number down only very slightly, from its original 14.6% to 13.4%, cutting 1.2% off the original 14.6%, or reducing that 14.6% by just 8% of that 14.6%, instead of by the promised 67% of it, much less by the originally promised 100% of it. Though the impact of the largely racist Republican intransigence against Obama has accounted for a portion of that failure (Republican governors trying to block it), the vast majority of this shortfall in the drop in the size of the uninsured population is due actually to Obamacare, the Affordable Care Act, itself. That law just wasn’t at all designed to be “making health insurance universal.” Obama lied, repeatedly. And America’s press let him get away with doing so. A Gallup poll on April 16th of this year indicated that, whereas in states that had Republican control and where Obamacare’s Medicaid expansion was rejected by the state’s governor, the decline in uninsureds was only around 4%; the states that had Democratic control and where the governor accepted the Medicaid expansion experienced a decline in uninsureds of around 16% (which though much better was still far short of President Obama’s promised 67% nationwide decline, or of candidate Obama’s promised nationwide decline of 100% on which he had won the White House). So, even in the states that didn’t do anything to block Obamacare, the decline in uninsureds fell far short of candidate Obama’s promised 67% decline in that number. Moreover, though economists say that the “recession” in the United States ended in June 2009, all of the economic gains went to only the top 1%, and the bottom 99% remained flat after the Bush “recession” (no gain, no loss, overall); so, virtually all Americans also haven’t benefitted from the “end of the recession.” Obama’s economics have aided only the top 1%. Furthermore, Gallup reported on October 3rd that whereas 20% of Americans who intend to vote next month are intending to vote in the congressional elections as a “message to support” Obama, 32% intend to vote as a “message to oppose” him. He’s a net 12% deadweight to Democratic congressional candidates. Only Bush in 2006 was in Obama’s league in that regard, he was a net 13% deadweight, and Republicans lost 6 Senate seats and 32 House seats as a result. The mood of the country is against both Parties, but especially against Democrats (because of Obama). On July 19th, I did an analysis of polls which argued that the only way that the last two years of Obama’s Presidency won’t turn out to be filled with his signing into law many new pieces of legislation that have passed two very conservative Republican houses of Congress (a Republican House and a Republican Senate), would be if a Democratic member of the U.S. House of Representatives introduces a bill to impeach President Obama. Practically all Republicans in Congress would vote for it, and many Democrats in Congress also would; the net effect would benefit congressional Democrats by removing from their backs the Obama-deadweight. That conclusion seems even truer today. If no House Democrat introduces a bill to impeach the most unpopular President since Nixon, this country will get to know how conservative Barack Obama really is (and secretly always has been). He is a Republican in ‘Democratic’ verbal clothing, but Republicans won’t admit it, and Democrats won’t see it. The elections on November 8th — exactly one month away — will produce the most conservative U.S. Government since before the time of Franklin Delano Roosevelt. Obama, in his heart of hearts, will be delighted. But every Democrat in the U.S. House of Representatives has the power to prevent it from happening — if the time hasn’t already gotten too late to do so.